Each of Sabi Sabi’s four beautiful lodges has a unique character, special feel, specific architecture and singular breath-taking views. Whether it’s the sweeping outlook from Bush Lodge’s decks, the direct views into the bushveld from the private verandas at Little Bush Camp, the secluded panorama from the private pool at each Earth Lodge suite or the vast expanse of the Southern night sky at Selati Camp, the view at each lodge holds its own attraction. Selati Camp looks out over the tree-lined Msuthlu Riverbed and grassy plain to a busy waterhole. Guests are often amazed to see the variety of animals, including the Big 5, drinking there at various times of the day; while the cool river bed is frequented by elephants, mischievous baboons and sly leopards weaving through the shade. 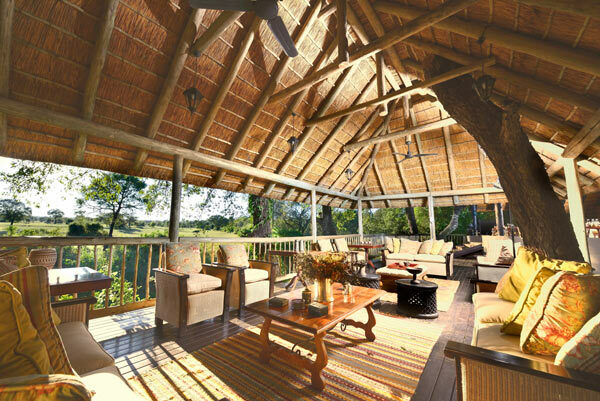 The newly refurbished lounge and bar lead out onto a beautiful covered wooden deck, furnished with comfy upholstered armchairs – the perfect spot to sit back and watch the unending rhythm of daily life in the bush. Each suite with its own secluded outlook onto different aspects of the bushveld offers the chance of seeing animals silently stepping through the wild grasses. Several kilometres away, Little Bush Camp is also built along the banks of the Msuthlu River and each suite’s private deck looks out onto the riverine terrain. In the dry season animals meander along the riverbed in search of tender grass shoots, and in summer the rains leave behind crystal pools which are quickly filled with water lilies. 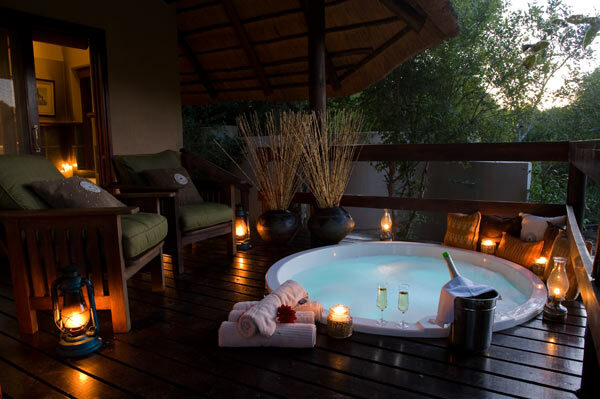 Spa baths on the deck are ideal for a relaxing soak accompanied by a delicious cocktail and the chance to unwind in the silence while absorbing the bushveld just meters below. At Bush Lodge the amazing outlooks starts right from reception, with a view straight through to the busy waterhole beyond. Guests are often welcomed to the lodge with sightings of herds of elephants enjoying their midday drink and splash. Two huge wooden decks and pools invite guests to get comfortable and watch a parade of animals meandering across a huge plain to slake their thirst at the water, or relax in the shade of the enormous Jackalberry tree at the pans edge. Kudu and nyala, waterbuck and warthogs, and even lion, leopard and wild dogs ramble across the plain, some species more skittish than others. Sit for long enough and an astonishing array of birds will make their appearance – identified by their beautiful plumage or distinct calls. 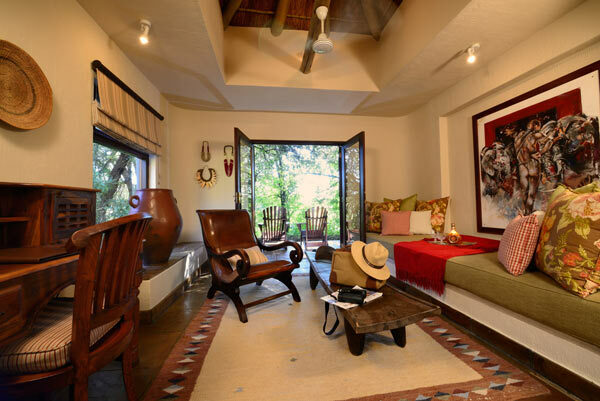 Glass sliding doors opening onto a private outdoor sitting area with lounging chairs, and indoor plus al fresco showers in the glass fronted bathrooms give the opportunity to enjoy the African bush in a completely private setting. Earth Lodge was built on a rise in the reserve which gives it a magnificent outlook over the surrounding bushveld. 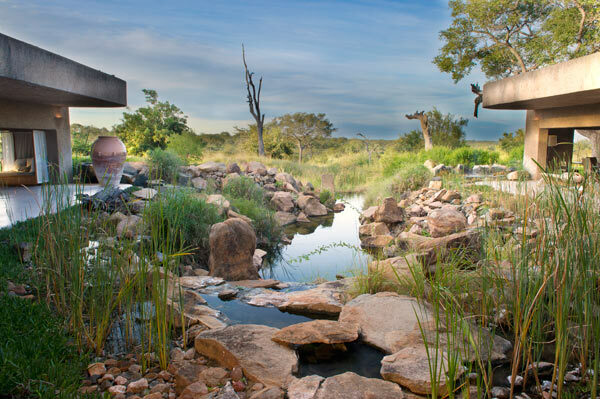 As the wooden lodge doors open at the end of the hidden pathway, an unexpected bushveld panorama unfolds. The imposing vista includes a small dam in which a male hippo is frequently found, comfortably swimming and snoozing in its home away from the river. The dam is constantly alive with various birds and animals. Gorgeous water features in front of the lodge make relaxing and gazing at the bush at any time of the day a beautiful experience – always quite exciting – with the prospect of catching a glimpse of one of Sabi Sabi’s predatory cats, lion, leopard or cheetah, a real possibility. Enormous glass fronted suites and bathrooms have a seemingly endless view of the Sabi Sabi reserve and its magnificent wildlife. But why stay indoors for the view, each suite has its own patio and private plunge pool right at the edge of the bushveld. What a glorious way of enjoying the sights and sounds of the wild. Whichever lodge, whichever suite, the views at Sabi Sabi are simply out of this world.